There’s a simple but profoundly useful concept taught be ancient to modern thinkers who ponder business, ethical, moral, political or other issues. It’s simple. When confronted with a choice, neither of which is perfect, by definition each is a some level of ‘evil’ or imperfection. Which choice does the thoughtful person make? Morally or logically, the lessor of the two imperfect or ‘evil’ choices. 1) The featured image above, are MHAction and the National Manufactured Home Owners Association (NMHOA). Both of those groups purport to be working on behalf of the interests of the owners of pre-HUD Code mobile home owners, as well as the millions of owners of manufactured homes. 2) There are currently two, and an emerging third, national trade association. There is the Manufactured Housing Institute (MHI), and the Manufactured Housing Association for Regulatory Reform (MHARR). They each have a different mission statement, with MHI claiming to represent both production and post-production interests, and MHARR plainly stating that they work for the interests of mitigating regulatory issues that face independent producers of manufactured homes. 3) There are two major political parties. As almost any American adult in the U.S. would know, there are Democrats and there are Republicans (a.k.a., the Grand Old Party or GOP). Each major party, plus minor parties like Libertarians, advance their candidates for local, state or national offices. 4) For fun and fairness, we could point to ourselves as trade publishers, and say the same thing. Compare what we do, with what any other remaining or new trade publisher does in manufactured housing. 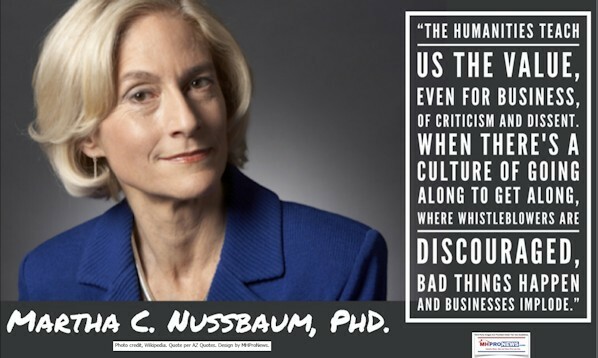 Who brings you pablum, platitudes, or thinly veiled promotions vs. who brings you news, facts, analysis, and commentary that can be used to navigate the waters that businesses, professionals, and investors face? Note none of the above – including ourselves – are perfect. By definition, any lack of perfection in philosophical jargon is some degree of ‘evil,’ not pure evil, but an imperfection. Between imperfect choices, which choices from the above will people make? one doesn’t vote at all. The industry often opposes these. Resident groups are engaged at the state level by a number of state associations. MHI and MHARR have engaged at various times and ways with NMHOA, though on differing topics. MHARR is not directly involved in community issues, but they do promote a robust entry by the GSEs into manufactured home lending, as one of several topics that are important to communities, retailers, and thus producers. There are good reasons to believe this the upcoming midterm election could be the biggest in years, perhaps, in a generation or more. Rob Weymouth, has been claimed as a member by the leadership of Delaware Manufactured Home Owner Association (DMHOA), which affiliates with both NMHOA and MHAction. Weymouth, perhaps not realizing his illogical argument, in several letters to the editor in his area, has written arguing that Democrats needed to be elected, even though he admits in his own column, that the Democrats who passed a rent-control bill was “useless” to manufactured home owners. Useless legislation, but vote for those that passed it? That said, Weymouth is urging manufactured homeowners to vote Democratic. Tim Sheahan, is the president of the NMHOA. He had a lengthy submission to the FHFA on the topic of the Duty to Serve (DTS) by Government Sponsored Enterprises (GSEs) of Fannie Mae and Freddie Mac. In it, he made several interesting points, which wittingly or not, he later logically contradicted. See the report, linked below for specifics. The tactics and positions taken by NMHOA or MHAction tend to align more with Democratic than Republican politics. If they see that differently, they’re leadership is welcome to send me a letter to the editor to clear up any confusion on that point. But so far, what’s been communicated privately and publicly led us to that conclusion. Let me be clear. The analysis we’ve done are not put-downs to Weymouth or Sheahan. Manufactured home residents deserve respect. There are few in the industry who’ve done more to lift up the image of manufactured home owners, as what we’ve done on MHLivingNews.com. For years, we’ve spotlighted morality tales of what not to do, when we publish articles about businesses that have gotten in legal hot water for wronging one or more residents. So, the purpose of public discourse – there’s, our’s or other’s ideas – is to advance concepts. Those visions ought to be examined and tested logically, using our God-given common-sense. No formal training in logic or debate is needed to analyze someone’s perspective. What is needed, is objectivity and common-sense. What’s helpful is applying simple principles, like the lesser of two evils. For some time, MHProNews has systematically examined numerous issues that impact manufactured housing and manufactured home owners. It has led up to this moment. What’s the best way to advance the interests of manufactured home owners and businesses alike? Let’s keep it simple. Some respond to emotional appeals. Set aside pure emotions, which can be manipulated. As Poverty Inc demonstrated, what sounds big hearted can in fact be harmful to the very people that people of good will intend to help. Let’s give NMHOA and MHAction the benefit of the doubt for now. Let’s say, for discussion’s sake, that they want the best interest of hundreds of their members or millions of MH residents. Let’s further say they aren’t working – as MHAction’s ties suggest – for the interests of billionaires like George Soros. If that is so, then who is doing more for manufactured home residents? Is it Democrats, as Weymouth and his DMHOA leadership think? Or is it the emerging new GOP, under President Donald J. Trump? What precisely did the administration of President Barack H. Obama do for MH residents during his 8 years in office? Compare that to what the President of the United States (POTUS) Donald J. Trump has already done to raise millions of more people out of poverty? Think about how in 20 months millions are off of food stamps, have new jobs with higher pay, have lower utility bills, more take home pay, and more. Better paying jobs that President Obama said would never come back, are back under President Trump. Set aside style or tweets, etc, and look at results. Considered objectively, isn’t it an easy comparison between Mr. Obama and POTUS Trump? Former President Obama, unable to stand on his actual record, is now back on the campaign trail. He’s trying to imply or claim in recent days that the increasingly booming economy is due to his policies. That’s easily debunked nonsense. Coal, manufacturing, and other jobs that Mr. Obama said would never come back, are under President Trump’s pro-growth policies. The fact that Mr. Obama even feels the need to make such obviously false claims should speak volumes. Don’t let the supposedly soaring rhetoric carry your colleagues off. Because a growing number of the former 44th president’s supporters left him for the Trump movement. In fact, about 1/3 of the counties that candidate Obama won, where won years later by candidate Donald J. Trump. Under President Obama, starting with his first midterms, Democrats lost a net of some 1,000 seats at the federal, state and local levels. Keep in mind, that President Trump, much like the late President Ronald Reagan, is a former Democrat. That fact caused concerns for many in the GOP power structure. has boosted investments in American businesses, which is good for owners, investors, and professionals. It is those investors that could – under the right policies – begin building more communities that could rebalance the supply-demand equation for manufactured home community residents. Here’s the bottom line. 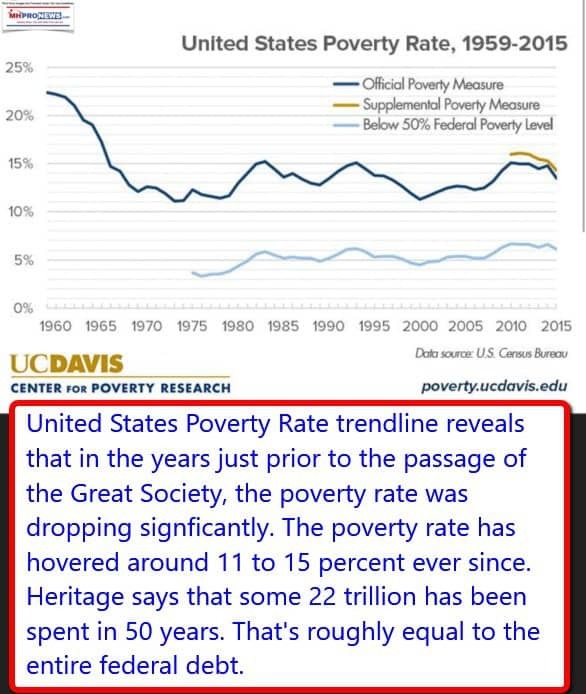 Democratic policies since the Great Society some 50 years ago, spent over $22 trillion dollars until 2014, with no appreciable difference in poverty rates. The principles of Poverty, Inc – applied to the U.S. – will tell us that what’s needed is to clear the path for small businesses to open, operate and do business that lift people out of poverty and create opportunities. both into less than ideal or even problematic positions. It will take clear thinking, facts, and evidence to correct what’s gone wrong in manufactured housing. MHARR, outspent by some 7 to 1 by MHI, has routinely picked the correct positions time and again on issues that face the industry. By contrast, MHI has repeatedly taken positions that they claim are good for many, but in fact work for the interests of a few ‘consolidators’ of smaller businesses. It is hard to find something good to say (sorry) about the public positions and actions of MHAction. There is clear overlap between MHAction and NMHOA. That said, both NMHOA and MHAction, along with their state affiliates need to be engaged, as some professional associations have tried. But it is resident group’s thinking that must be engaged, analyzed and put on display, as we have in articles linked from this column, above and below. Ishbel Dickens said she was open to a public discussion debate of the issues with me, but never actually did so. We’ve more recently made a similar invitation to NMHOA and MHAction’s current leaders. We’ll see what they do, but so far, there’s no one jumping at the chance. Why not? Do they lack confidence in their positions? If they are not willing to defend their positions, perhaps they should consider changing them? In fact, that’s the purpose of analysis and debate. To discern through testing what’s true, what’s not, so that people can make the best decisions moving ahead. The answer for residents is demonstrably not rent control, Nor is it Democratic policies. Frankly, it isn’t purely Republican policies that will fix things either. As an independent, President Donald Trump’s policies – which blend elements from both major parties – are what could prove to be the path ahead. MHARR’s president and former president said as much. See the video, below. Looking back, isn’t it clear that they were right?